I know I'm asking for the close-to-impossible -- as a real full-backup certainly requires root permissions. But still there are many folks around not wanting to root their devices -- afraid of voiding their warranties or bricking their devices, or just not having their devices supported by any rooting method. I also know there were a lot of questions asked already on this topic, and I checked all of them having the backup tag -- none covers the entire topic, all just have pieces, and especially people new to Android (but other non-power-users as well) would have a hard time figuring out the best way. Not involving root-solutions, how to achieve a backup as close as possible to a full backup? Please do not give simple one-liner answers like "Use app xyz [full-stop]." If mentioning an app (and I doubt a single app would be the answer here), include what parts are covered by it -- as well as ideas on how to fill the gaps it leaves. (And to make it absolutely clear: I know the first thing coming to mind is Titanium Backup -- I use it myself, but this does not apply here: This question is strictly about methods for non-rooted devices!) Moreover, the answer should be as generic as possible in terms of applying to a wide range of devices (i.e. it should not be restricted to one device or manufacturer). How to backup an Android device? How do I perform a full pre-rooting backup of an Android phone? What info does Google backup? How can data on an unrooted phone be backed up? Could a non-root Android 4.0.3 smartphone's rom be backup? How do I back up (and restore) my phone before installing a custom ROM? Backup my Android without my Apps, Settings, Config's, etc. All these provide some details for my question (so feel free to get inspired by them) -- but I feel there are still details missing. Also it would be helpful to have a summary -- say, an answer including the full description of "the maximum possible". A last criterium: While I'd consider cloud-based solutions legit, I'd favour local solutions. If you can provide both: all the better. But some people value privacy quite high (I'm one of them), and thus would not trust their data to some cloud service. Thanks to Ryan, we now have a solution for a really complete backup of all apps and their data -- which I didn't dare to hope for! The only disadvantage: His solution only works for less than 10% of all Android users; namely those whose devices are running at least with Android 4.x. And keep in mind: NO ROOT! To further motivate high-quality answers (and hopefully avoid low-quality ones), I will be a harsh one here: As I rarely do, I will down-vote answers not fitting the mentioned criteria on one end -- but on the other end, I will setup a bounty for the best answer (which cannot be done immediately, but earliest after 2 days). For 4.0+ devices there is a solution called "adb backup". Note: This only works for apps that do not disallow backup! Apps that disallow backup are simply ignored when creating a backup using this way. This makes use of adb so you have to have the Android Software Development Kit (SDK) installed on your computer (on some Linux distributions: just packages android-tools-adb and android-tools-adbd). Second, on your PC from the command prompt you will need to be able to locate both the adb command and your backup file. The easiest way to do this is to run the adb command from the directory where adb is located. In Windows Explorer navigate to where you installed the Android SDK and SHIFT+RIGHT CLICK on the platform-tools folder. This will open a command prompt (your window will look different than mine). In Mac's Terminal you can type cd and then drag the folder platform-tools folder from finder to the terminal window and the path will be inserted. Hit and you will be in the right place. In Linux, I hope you know how to locate and cd to the parent directory of the adb command. You are using Linux after all. ## Notice that -all doesn't mean ALL. See the big bold NOTE at the top of this answer. To restore, it works almost the same way. Droid Explorer (v0.8.8.7+) will be able to handle this for 4.0+ devices. While Droid Explorer is currently optimized for Rooted devices, this functionality will work for non-rooted devices as well. Droid Explorer will do full backups of the device and save them in %USERPROFILE%\Android Backups\. Within that folder is a folder named for the device, and inside that folder are the backups. 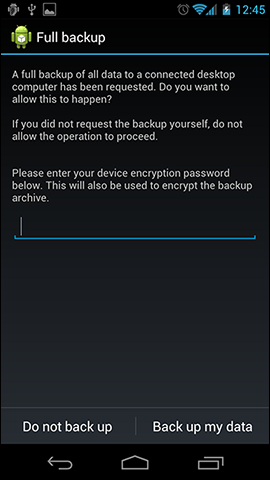 Double clicking on the Android Backup file will allow you to restore your device from the backup file. 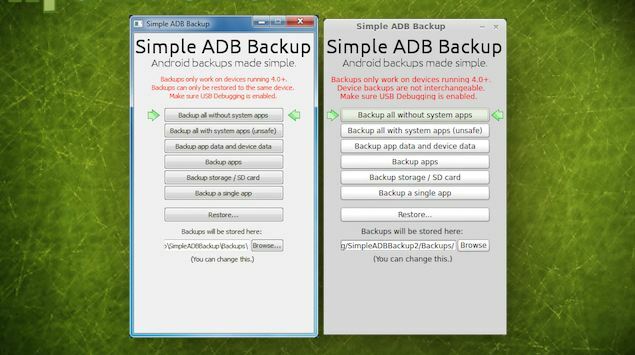 There is an application called Simple ADB Backup. 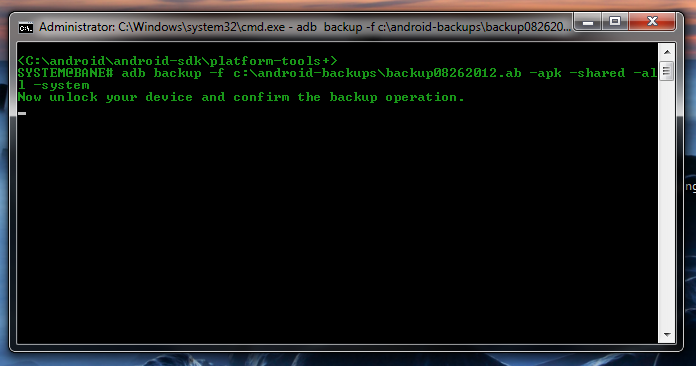 Simple ADB Backup Backs Up Your Android Phone from the Desktop, No Root Required. Most Android backup tools require root, or run from your phone and save your data to your SD card. Simple ADB Backup is different. The app runs from and backs up your phone's data to your desktop, and does it all without root. The app also lets you restore backed up data to your device. Before you back up, you'll be prompted to generate a password you'll also have to type into the app on your phone before the backup can begin, but after that, the process runs smoothly. It's extremely simple, completely free, and doesn't require you root first. Whilst Titanium Backup is a more feature-filled app if you're willing to root (especially if you want a bulletproof backup system for your Android), and MyBackup Pro is great if you're migrating to a new phone and don't want a desktop as a middleman, but Simple ADB Backup is free and apparently so easy to use that even Android beginners can easily and quickly back up their important data. Simple ADB Backup was released for free over at the XDA Developer forums. Hit the link below to download it there. Technically, you CAN create full Nandroid backup without rooting the device. You just need to flash CWM (or, any recovery which supports Nandroid backup) over USB. For example, you can use Odin (Windows) to flash CWM to Samsung devices after going to download mode, all without touching the Android. So, there's no rooting or root access involved at all. 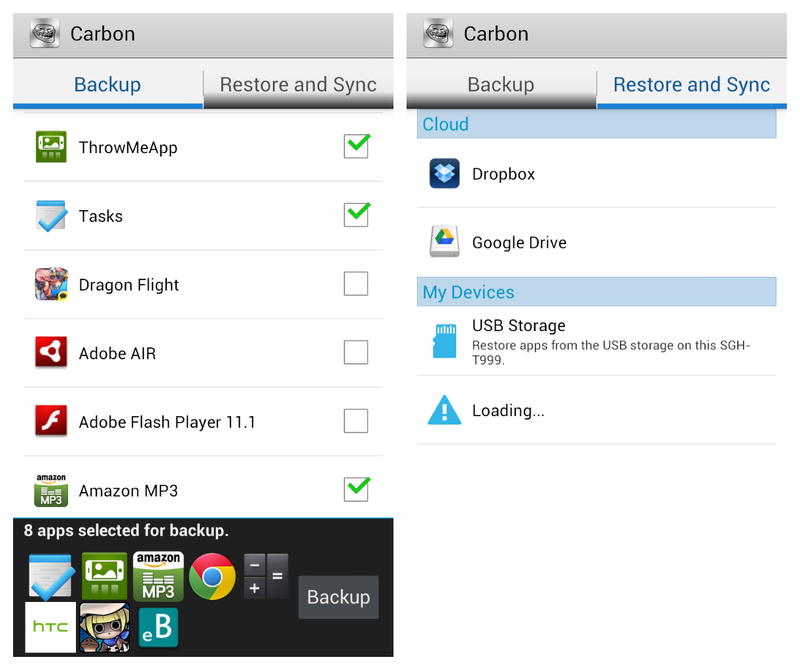 Helium Backup should be able to backup apps and data to SD card, attached USB devices, Dropbox, Google Drive or Box. This isn't a "full backup" in so far as it comes to system settings, but it does restore application settings and data. It does not backup your internal storage (the user files), so you'll have to backup those files separately. If you find yourself unable to see your backups in the restore list, some of the backup metadata may have gotten lost in translation. The backup themselves can still be restored, but you'll need some extra leg work to get them. Edit: For a full-fledged how-to on the usage of Helium, please see How to Backup Apps and Data without Root using Helium Android App (thanks for the hint, Simon!). And before complaining on anything, make sure you've checked with the Helium Wiki (thanks to golimar for pointing this out!). adb backup is far from complete, on a Nexus 3, both under an unrooted stock Android 4.3 and if run with adb root on Cyanogenmod 10.1.3! PROPERLY RESTORED: Custom vocabulary, wallpaper, launcher icon positions, apps and their settings. On Cyanogenmod the situation was a little different: SMS were completely restored, but contacts and call logs still not restored. Even when adb backup and restore where ran with an adb running as root through adb root. So I will try to use a custom ROM, with root (to get some extra features), a locked bootloader, custom recovery, and only flash the recovery temporarily (theoretically possible from the rooted device with flash_image, but for me this failed too), from which I then do NANDROID backups (or adb backup + special backup solutions for sms/call-logs/contacts) plus custom ROM updates. 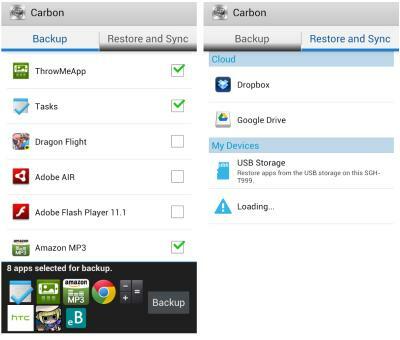 We can take the backup of our device without using any apps or without rooting our phone. Android includes a built-in way to back up and restore the contents of your phone or tablet. All you need is a computer and a device running Android 4.0 (Ice Cream Sandwich) or newer. Go to adt-bundle-windows-x86\sdk\platform-tools folder and open command promt here. Check that your device is connected by running "adb device". Now execute "adb backup -apk -shared -all -f C:\Users\UserName\backup.ab". Unlock your device, provide encrpytion password and your whole device will be backed up. To restore again simply execute "adb restore C:\Users\UserName\backup.ab". I have written step by step procedure with screen shots for the same here. Hope this helps! I'm a bit surprised by the other (complicated) answers. Maybe I've misunderstood the question so feel free to comment and vote accordingly. 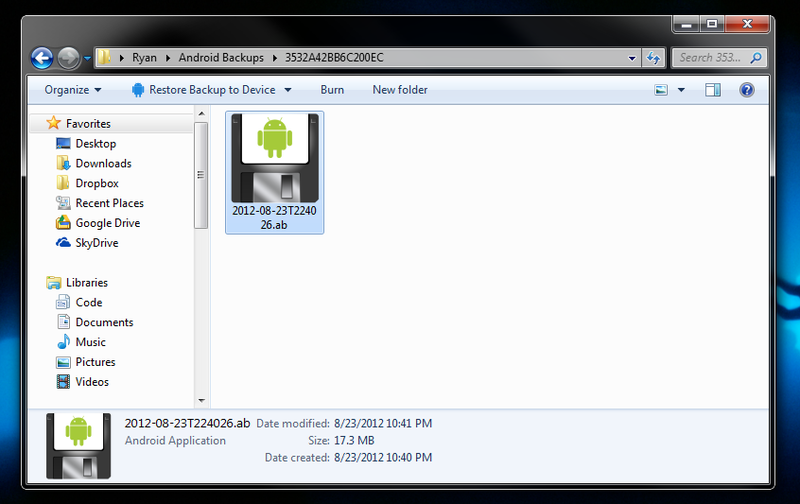 By definition a full backup (including ROM, apps and data) is called a Nandroid backup. Therefore the question is asking "how do I do a Nandroid backup on my unrooted device". You do not need a rooted device to be able to do a Nandroid backup. Nandroid backups are usually done through a custom recovery (like TWRP or Clockwordmod) which do not always need a rooted device to install. For example using ADB TWRP can be installed, as per the directions here. It may be possible to temporarily load a custom recovery, thus preserving the stock recovery (and your warranty; for TWRP this can be done replacing fastboot flash recovery twrp*.img with fastboot boot twrp*.img in step 4 of the linked tutorial). Some devices require the bootloader to be unlocked to install a custom recovery, others do not. 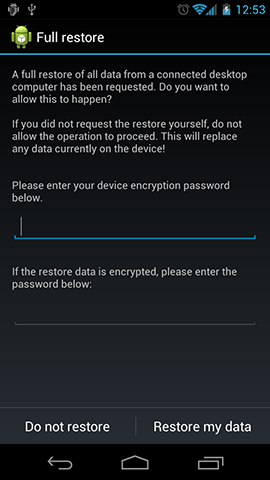 Note that unlocking the bootloader usually factory-resets your device. So the obvious follow-up question should be: restore your state from what? Scenario 0: Your phone is physically broken. Scenario 1: Your entire drive (eMMC) has been blanked. Scenario 2: You can only boot into a USB flash mode like fastboot/ODIN. Scenario 4: Your phone has been reset to factory mode. You have normal unrooted functionality. Scenario 5: Your accidentally deleted your favorite cat wallpaper image. Each of these scenarios can have a different backup solution. A full backup would have to be able to address all of them. Of course I'm trolling a bit with the broken phone scenario (0), but it points out how ill-defined this canonical question is. This reflects the fact that many people and companies tend to oversimplify backing up and ignore the most important part: restoring. Typically involves using a Nandroid (sector copy of most partitions) and maybe re-flashing a custom recovery. Bit technical. May affect the warranty. Typically restores apps and data, including your cat photos. Partial restores could work across different models. Both can be considered full backups for their use cases. Let the context determine if someone asking for a full backup wants option 1 or 2. There's a bit of gray area (3.5?) between scenario 3 and 4, e.g. if a user deleted files from the /system partition the restoration method may depend on what is missing. Variable results depending on the ROM (e.g. doesn't work on some Sony models, omits different items on CyanogenMod vs TouchWiz). Though recently in Oreo there have been small improvements (XDA news) I still can't confirm if it can copy all user files like photos and music copied from your pc. For a dev restore, you want a Nandroid. You can't get a full Nandroid without either rooting OR using a recovery. An exception is perhaps an image of your SD card, giving you a partial Nandroid. So you have to risk installing an image or temporarily rooting, or wait until OEMs offer better recoveries. Remember to name your backups with important information like date and partitions included. A Nandroid typically doesn't include a recovery, because they are usually applied from a recovery so it is redundant. But if your device is messed up and your recovery is gone you might panic, thinking you didn't back it up so there's nothing to restore. But it is often simple to download and then reinstall the recovery with a USB flash tool (e.g. fastboot). Similarly, if you store your contacts in the cloud, there is usually no need to back them up. Just sync again after restoring. Remember, a full backup depends on what you want to recover from. There is no perfect solution at the 'consumer level' I've described. In EU/Asian countries, where people aren't so worried about denial of warranty, there is little reason not to install a custom recovery if it exists. How do I take a full image backup of an Android device? Can a non-rooted Android 4.0.3 smartphone’s ROM be backed up? How to root my android device without losing data? Is it possible to transfer EVERYTHING from one Nexus 5 to another? How to backup my app data if my phone is not rooted? how to make complete os backup to create update.zip? Settings, App and Messages Backup AND restore of non-rooted Android 6+ devices?